Kelly pleaded guilty Wednesday to a charge of second-degree trespassing, Stephanie Butzer of ABC 7 Denver reports. Analysis: Kelly was arrested Oct. 23 and released by the Broncos the next day. He won't face any jail time as part of the plea agreement, but he may need to serve a suspension if he ever signs with an NFL team again. The 2017 seventh-round pick beat out Paxton Lynch for the No. 2 quarterback job in Denver last preseason. The Broncos cut Kelly on Tuesday, Mike Klis of 9News Denver reports. Kelly, who was arrested Tuesday in Englewood, Colo. on a charge of first-degree criminal trespassing, is expected to face discipline from the Broncos, if not the NFL, Mike Klis of 9News Denver reports. Kelly was arrested early Tuesday in Englewood, Colorado on a charge of first-degree criminal trespassing, Nicki Jhabvala of The Athletic reports. Analysis: Details remain scarce at this time while an investigation of the incident remains ongoing, but the 24-year-old was booked into Arapahoe County Jail following his arrest. The Broncos have been made aware of the arrest, but haven't commented on the matter. It's unclear if Kelly, who fell to the final pick in the 2017 NFL Draft in part due to a rash of off-field incidents during his time in college, will be available to back up starting quarterback Case Keenum in Sunday's game against the Chiefs. Kelly won't start for the Broncos in their Week 7 game against the Cardinals after coach Vance Joseph vouched support for incumbent Case Keenum after Sunday's 23-20 loss to the Rams, Nicki Jhabvala of The Athletic reports. "Case is our quarterback," Joseph said. Kelly will start the first half of the Broncos' fourth preseason game Thursday, Troy Renck of Denver 7 News reports. Analysis: Kelly will get the nod ahead of Paxton Lynch, which suggests the Broncos prefer Kelly as the backup heading into the regular season. The Ole Miss product will still have to perform well during the game, but it looks more and more like Kelly will be the primary option behind Case Keenum in 2018. Head coach Vance Joseph said that Kelly has received some first-team reps, the Broncos' official site reports. Analysis: Kelly completed seven of nine passes for 90 yards and a touchdown in his second consecutive strong preseason outing on Saturday. Don't read too much into the starting snaps, though. Denver's brass needs to determine whether Kelly can be a snap away from starting this season or whether a trade for someone like Teddy Bridgewater is necessary. The only way to determine that is to put him out there against a starting defense. Kelly supplanted Paxton Lynch as the Broncos' backup quarterback, Ian Rapoport of NFL Network reports. The Broncos have been pleased with Kelly's performance in the team's initial practices of training camp, but head coach Vance Joseph isn't ready to move the second-year signal-caller above Paxton Lynch for the No. 2 spot on the depth chart, Ryan O'Halloran of The Denver Post reports. "Chad looked good," Joseph said after Sunday's session. "[Playing with the second team] hasn't happened yet. It could happen in the future." Kelly had impressive moments during spring workouts, Mike Klis of 9News Denver reports. Analysis: General manager John Elway said back in April that Kelly will be competing with the disappointing Paxton Lynch for No. 2 duties in Denver, per Jeff Legwold of ESPN. Now recovered from the wrist injury he suffered during his final season in college, Kelly seems to be taking full advantage of Lynch's continued struggles. If the latter can't turn things around, Kelly could realistically open the 2018 season as the direct backup to Case Keenum. 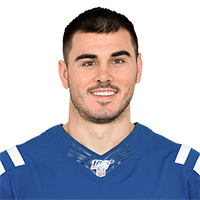 Kelly (wrist) will reportedly battle Paxton Lynch for the backup quarterback spot in Denver, James Palmer of NFL Network reports. Analysis: Although he's still nursing a wrist injury, the expectation is that Kelly will be 100 percent by the time training camp rolls around. With the Broncos opting not to draft a quarterback, Kelly will have the chance to earn the No. 2 spot behind Case Keenum. 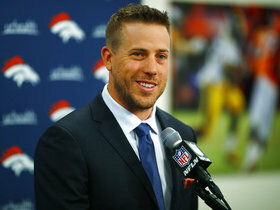 Kelly (wrist) is expected to be fully healed and ready to throw during the Broncos' Organized Team Activities in the spring, Nick Kosmider of The Denver Post reports. Kelly (wrist) will be placed on injured reserve Monday, Zac Stevens of BSNDenver.com reports. Analysis: Despite the troubles under center in Denver, the Broncos don't feel that Kelly is ready from a health standpoint at the moment. With his placement on IR, Kelly will have to wait to showcase any ability of his until next season. Kelly (wrist) is unlikely to be activated from the Non-Football Injury list this season, Nick Kosmider of The Denver Post reports. Analysis: Kelly is nearing the end of the 21-day window in which he can be activated, and only started light practicing this week. The rookie seventh-round pick would be the Broncos' fourth quarterback and has no clear place on the team's roster, making him unlikely to be activated barring an injury to a Denver quarterback this week. 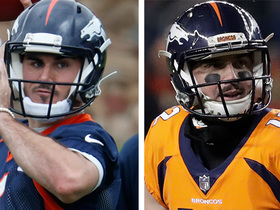 NFL Network's James Palmer reports the the Denver Broncos backup quarterback job is up for grabs in a competition between Paxton Lynch and Chad Kelly. Broncos executive vice president of football operations John Elway talks about the QB competition the team will have between QBs Case Keenum, Paxton Lynch and Chad Kelly.